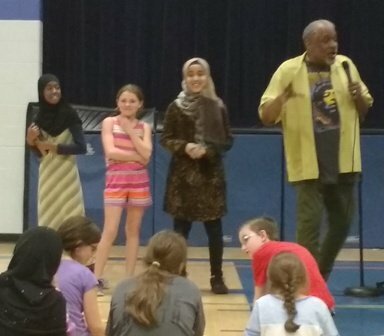 Internationally renowned children’s author – and friend of Windsor Public Library – Christopher Paul Curtis dropped by Sandwich Branch recently to meet school children, read from his works and motivate students to read and become more involved in the creative writing process. Close to 400 students from General Brock, Marlborough and West Gate public schools were in attendance. Many of the children in attendance have ties with the Library Live Children’s Writing Club and for those between the ages of 8 and 16 wanting to get involved, now is the perfect time. Meetings are held at Sandwich Branch on Thursdays during May from 3 to 5 pm. As space is limited to 15 participants a week, registration is suggested. Please call 519-255-6770, Ext. 7700 for registration information. Christopher Paul Curtis is best known for award winning books such as: THE MADMEN OF PINEY WOODS, ELIJAH OF BUXTON, both of which are set in Essex County; BUD, NOT BUDDY which won the prestigious Newbery Award and was recently made into a play in Chicago; and THE WATSON’S GO TO BIRMINGHAM, which was made into a Hallmark Feature Film.